Conflict is often perceived as a negative occurrence. Traditionally, the court system, as well as attorneys, create an adversarial environment that encourages parental conflict. In the courtroom, conflict is seen as a battle of “win” versus “lose” and “good” versus “bad.” As the battle intensifies, the parental relationship deteriorates and animosity becomes the norm. Contrary to popular belief, conflict does not need to be mismanaged; it can be used as an opportunity for growth. 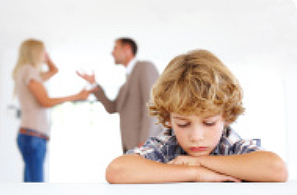 According to Dudley Weeks, PhD, “Conflict can serve as one of the engines or personal development and social evolution, generating opportunities to learn from and adapt to the diversities and differences that are natural and healthy characteristics of our society.” Parents who are separating have the power to develop and maintain positive, practical conflict resolution skills. In the context of divorce, more often than not parents lose their former unity. Additionally, differences in parenting styles are magnified, therefore bitterness and revenge become the hallmark of their relationship. If handled effectively, conflict can challenge parents to manage their co-parenting partnership in ways that use their differences for mutual growth and benefit. Regardless of the litigious environment in which divorce is embedded, you have the power to make positive changes that will benefit not only you and your co-parenting relationship, but also your child’s well being. You can adopt the practical skills necessary to deal with conflict effectively, and you can make changes in the way you handle conflict. This can be done even though the other parent, attorneys and the courts choose not to join you in your efforts. If you are willing to make a commitment to your child, you will be taking the first-step to a conflict-free relationship with your child’s other parent. The remaining of this article will guide you in taking the seven additional steps to manage conflict effectively. Step two focuses on allowing your child to love both parents. Don’t place your child in situations where they are forced to choose one parent over the other. When this happens your child feels like he/she is in a tug of war between two battling parents and may believe they have to choose sides, thus preventing him/her from loving both parents. Instead, show acceptance of your child’s two homes. Keep some clothes and personal items at each residence, and make sure you create a space for child in each home. This shows that your child is a permanent residence in each home, not just a visitor or a guest. Changing your long term role is step three. This step challenges you to create a new co-parenting relationship with the other parent or to hold on to the past marital relationship. The cost of holding on to your past relationship can eat away at your health and self-esteem and as a result create significant stress for your child. In order for you and your child to thrive, it is necessary to let go of the old relationship. Step four requires you to choose your personal path. One of the healthiest ways to survive is to let go of the old role and emotions associated with the past, and begin your new role as co-parents. Ask yourself, are you ready to move on by making the parental relationship better or are you choosing to keep it bitter? The path you choose will significantly affect your child’s emotional future. Letting go of the old relationship allows you to emotionally disengage and realign your relationship from former partner to co-parent. Managing your anger is step five. Anger has many methods of destruction, but it also has the potential to be constructive. Anger can provide motivation, help you overcome obstacles and propel you to reach greater achievements, including deciding not to fight, which in turn creates a better and more nurturing environment for your child. Step six is taking control of conflict by practicing effective communication skills. Control your tone of voice, body language and choice of words. Learn reflective listening and the use of “I-Statements”. Remember you can start an argument as well as stop one from developing. Focus on your child’s needs and keep yourself and your child out of the crossfire. Step seven is negotiating agreements. You and your co-parent will bring differing opinions and perceptions into a discussion of decisions requiring a solution. Continuing the conflict prevents you and your coparent from finding a solution. Don’t adopt the mindset of a “winner that takes all”. Instead declare your self a winner by solving problems in a way that meets your child’s best interests. Finally, recognize that co-parenting is forever. Keeping the relationship between your child and both parents positive during and after the separation is of primary importance. Dedicate yourself to giving your child the gift of a strong co-parenting relationship.